Karl Rahner was one of modern theology's most prolific and accomplished essayists. He was a consummate master of the genre, using essays to develop unsystematic sketches, suggestive hints, paths for future exploration. His great essay collection, Theological Investigations, spans 23 volumes and covers innumerable theological topics. Unfortunately, the arrangement of these essays is often more or less arbitrary, making it difficult to track down Rahner's writing on a particular theme. So I've often made use of Daniel Pekarske's marvellous 659-page reference work, Abstracts of Karl Rahner's Theological Investigations 1-23 (Marquette University Press 2002) – a true labour of love, in which Pekarske provides a concise, informative overview of each essay, together with a detailed index. So I was delighted to see that Pekarske has now released the sequel: Abstracts of Karl Rahner's Unserialized Essays (Marquette University Press 2009), 565 pp. In this volume, Pekarske provides abstracts of numerous essays that didn't make it into the Theological Investigations. 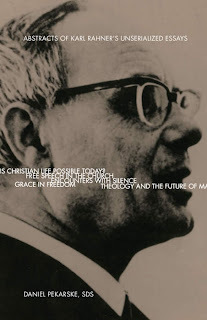 As you'd expect, the essays here represent the extraordinary breadth of Rahner's interests – there are essays on Marxism and the economy, Concilium and renewal, prayer and silence, freedom and hominisation. As in the previous volume, Pekarske provides a very brief abstract of each essay, followed by a list of main keywords, then a list of subsidiary topics (these are often the most interesting bits), and finally a more detailed precis of the essay's argument. Students of modern theology are indebted to Pekarske for his selfless and painstaking labours. With these unique reference works, the vast library of Rahner's essays becomes less daunting and much more accessible.